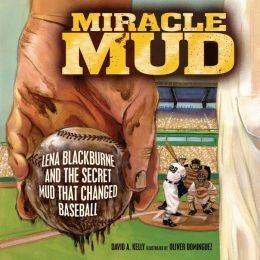 Miracle Mud: Lena Blackburne and the Secret Mud that Changed Baseball written by David A. Kelly is the story and history of how Lena Blackburne’s mud went from a riverbank to the major leagues and all the way to the Hall of Fame! It is a story anyone interested in baseball facts and trivia would enjoy and is for readers as young as first grade to those in their senior years. I see this as a perfect book to be read to young readers by an avid baseball fan in that young reader’s life such as a mom, dad, uncle, aunt, or grandparent. Lena Blackburne never became a famous ball player, but he did contribute to baseball in a major league way by unveiling a secret recipe to break in new baseballs. His recipe was so successful that baseball teams have been buying his tubbed mud for close to seventy-five years. In fact, Lena’s mud is the only thing that’s allowed on major league balls. Readers are sure to appreciate Oliver Dominguez’s life-like illustrations that make you feel like you are on the baseball field ready to play ball with the touch and feel of Lena’s mud on your hands. Baseball history buffs will especially enjoy Kelly’s author note at the end. Sports fans will also enjoy other books by David A. Kelly such as early reader title, Babe Ruth and the Baseball Curse or Ballpark Mysteries, a series aimed at those at the first to fourth grade reading level and is about two cousins who travel to Major League ballparks across the country with Kate’s sports-reporter mother watching games and solving mysteries.